BEIJING, Nov. 2 (Xinhua) -- China is willing to promote bilateral trade and people-to-people exchanges with the Dominican Republic, Chinese Premier Li Keqiang said Friday. Li made the remarks while meeting with the Dominican Republic President Danilo Medina, who is on a state visit to China and will attend the first China International Import Expo, which runs from Nov. 5 to 10 in Shanghai. 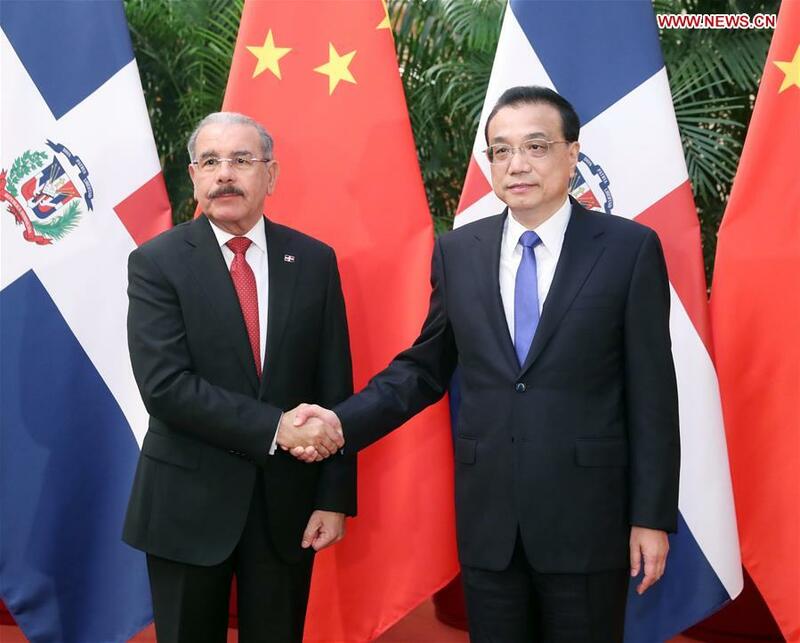 Li said the establishment of diplomatic ties between China and the Dominican Republic in May confirms to the fundamental interests of the two peoples and opened a new chapter in bilateral relations. Noting that the two countries' economies are highly complementary and that there is a huge potential for pragmatic cooperation, Li said the Chinese side supports its competent enterprises and financial institutions to deepen infrastructure construction cooperation with the Dominican Republic in areas such as electricity and transportation based on market rules and commercial principles. "China is willing to import more products from the Dominican Republic that are competitive and of high quality, and enhance bilateral trade exchanges," Li said, also hoping the two countries to expand people-to-people exchanges and tourism cooperation. For his part, Medina said Dominican Republic-China cooperation has yielded fruitful results since the two countries established diplomatic relations. "We welcome Chinese enterprises to invest and develop in the Dominican Republic," he said, adding that his country hopes to increase exports to China and deepen cooperation with China in electricity and other areas for greater mutual benefits.